A New Year usually brings with it both a sense of reflection and the possibility of change and, for us, 2016 was no exception. 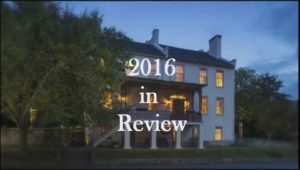 We entered our second year of Innkeeping last January with a lot of big plans for the Inn, and we wanted to finish the year by looking back and celebrating all of the events and changes that took place. From all of us at the Jacob Rohrbach Inn: “THANK YOU!” Thank you for your business, friendship, loyalty, and support in 2016 and we look forward to seeing you again in 2017!